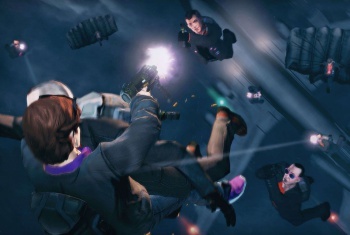 Wacky open-world sandbox action franchise Saints Row may be headed to the silver screen. As THQ fell apart over the past year, its properties were auctioned off piecemeal to a number of other companies. As a result, the rights to the Saints Row franchise are now owned by Deep Silver, a publisher most notable for the Dead Island games. That point of fame may be shifting however, as the company is currently looking into the possibility of creating a Saints Row film. Speaking with VentureBeat, Klemens Kundratitz, CEO of Deep Silver parent company Koch Media, outlined the company's various options and ideas of what it might like to pursue. "[Those movies are] not out of the question," he says. "If a company can deliver that transmedia experience, we are probably one of the few that have the ambition and ability to deliver that." Kundratitz has a point there: Koch Media has long had a hand in the film creation business. As VentureBeat notes, the firm helped create movies like Margin Call and Before The Devil Knows You're Dead. Despite this, Kundratitz remains realistic about Koch Media's place in the hierarchy of the film biz. "... I have to be honest, we have not been able to deliver that [experience] yet," Kundratitz states. "But it's one of my long-term strategic goals to do so." While this means that any potential Saints Row film is likely a long ways off, it is fun to think about how exactly the franchise might make the leap to the silver screen. Unlike most other sandbox games, the Saints Row series features many diverse characters with their own motivations that carry over from game to game. It might be difficult to include "Boss" as he/she represents the player's customized character, but Johnny Gat et alia would make great movie fixtures. Plus, given the high-caliber voice acting in the games, the cast of the film already exists: Simply hire the voice actors - most of whom also act on screen - and you're set. The only question is when this hypothetical film would take place in the Saints Row timeline. If it's recent that means Johnny Gat would either be a corpse or a zombie, removing one of the best characters in the franchise. Hopefully the writing team can come up with a solid workaround for this problem.